In 1990 a paperback book’s title captured my attention while browsing through a bookstore (I frequently haunted bookstores; I miss it). It was written by one Martin E.P. Seligman, Ph.D. I knew I had to read it ’cause the author had TWO middle initials. E.P. stands for Elias Pete by the way. That actually had nothing to do with my buying the book, but I found it interesting nonetheless. Positive Psychology is the scientific study of the strengths that enable individuals and communities to thrive. The field is founded on the belief that people want to lead meaningful and fulfilling lives, to cultivate what is best within themselves, and to enhance their experiences of love, work, and play. There’s a chapter about kids. 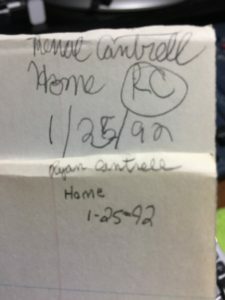 On January 25, 1992 I had my two kids take an assessment contained in the book. My kids were both under the age of 12. I’ve still got their answers, written in their own handwriting. 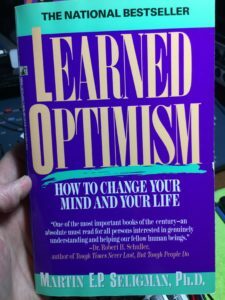 It’s proof of how interested I was in helping my kids grow up to be optimistic. According to Dr. Seligman, there are 3 crucial dimensions to our explanatory style: permanence, pervasiveness, and personalization. Today, let’s focus a bit on that first dimension, permanence. People who quit or give up easily believe the causes of the bad events that happen to them are permanent. They think the bad events will persist, always impacting their life. People who resist hopelessness believe the causes of the bad events are temporary. If you think about bad things and attach words like “always” and “never,” then you’re bent toward a permanent, pessimistic style. “This always happens to me,” is a common refrain we heard. Maybe from our own lips. “I never seem to win,” is another common one. Contrast those terms with these: “sometimes” or “lately.” Those kinds of qualifiers, says Dr. Seligman, blame bad events on transient conditions and mean we have a more optimistic style. Hopelessness is real for all of us. Sometimes. Because failure makes us all feel hopeless momentarily. We describe it as a gut punch. It buckles our knees. It hurts. Badly sometimes. But the hurt dissipates. For some, it can go away almost immediately. For others, it takes more time. Still, others don’t seem to get over it. They seethe, feeding the pain until it grows into bitterness. These people can remain helpless and hopeless for a long time, even after a small setback. If the hurt is big enough, they may not ever find their way back. The flip side of this is how we explain good events. No point talking about how we process bad events without considering how we process good ones. The optimistic style of explaining good events is just the opposite of the optimistic style of explaining bad ones. People who believe good events have permanent causes are more optimistic than people who believe they have temporary causes. Optimistic people explain good events to themselves in terms of permanent causes. That’s why their self-talk includes terms like traits, abilities and always. Pessimists use different language: moods, effort, sometimes. People who believe good events have permanent causes try even harder after they succeed. People who see temporary reasons for good events may give up even when they succeed because they’re tempted to believe the success was a fluke. That’s why yesterday I urged you to keep growing if you’re “on the gold.” Lean into the success and create even more success. This particular dimension of our explanatory style – permanence – deals with TIME. It’s important that you – the leader, the business owner – learn to be optimistic and view failure or bad events as merely temporary conditions on the path to success. While simultaneously seeing good events and success as being more permanent and things well within our control. Why does this matter? Because it will determine our outcomes and the outcomes of our organizations. Pay close attention to the language you use with yourself and with others. You can start changing that language to something more profitable, but I encourage you to do some deeper work by changing your mind so you truly believe.